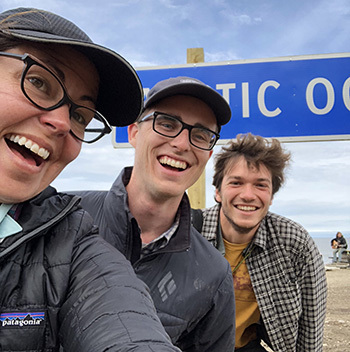 Beth Shapiro with graduate student and teaching assistant Josh Kapp and undergraduate Chris Garrison at the Arctic Ocean. They got cold and wet, slogged through mud and muck, were eaten alive by mosquitoes, and they all agreed it was one of the best experiences of their lives. 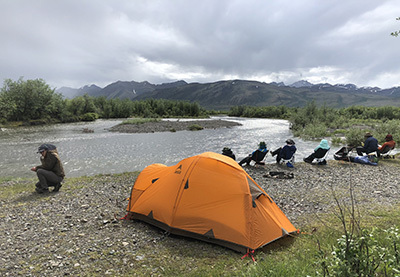 Thirteen UC Santa Cruz undergraduates led by Beth Shapiro, professor of ecology and evolutionary biology, traveled 2,800 miles through Alaska and the Yukon territory this summer, doing field work at research sites and studying the effects of climate change in the far north. "Hands down the best experience I've had to date," said Molly Cassatt-Johnstone. "We'd been learning about all these things in the classroom, and then we actually got to go and see how climate change is affecting the land and people in the Arctic." 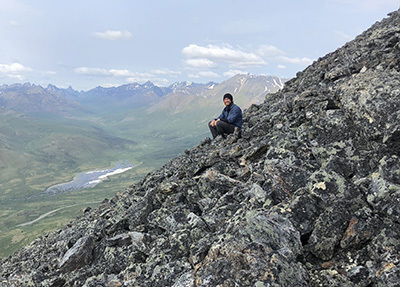 "It's one thing to read about climate change and how the ice is melting in the Arctic, but it's another thing to go out and see it," said Christopher Garrison. "You see how real it is when the roads are buckling and full of cracks and dips because the permafrost is melting under the road." 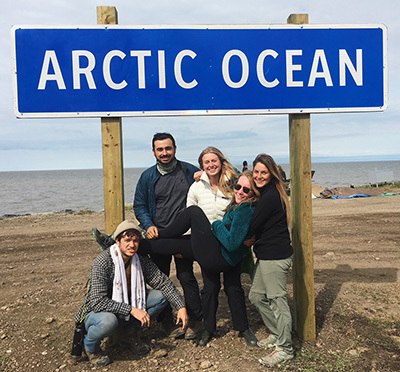 Offered for the first time this year, Shapiro's course on Arctic Ecology and Environmental Change started in the classroom in spring 2018. The course covered the region's ecology, geology, geography, ice ages, animal migrations, human history, science communication, and more. Two teaching assistants and a course assistant helped with teaching and logistics, and a series of guest lecturers shared their expertise in various subjects. Each student investigated a specific topic related to environmental change in the Arctic and wrote and produced a podcast on it. In June, they gathered in Whitehorse, the capital of Canada's Yukon territory, to start the field component. The three-week camping and road trip took the class to remote research stations, gold mining sites where the bones of woolly mammoths and other ice age animals are being uncovered, the historic mining town of Dawson City, and up the Yukon's famed Dempster Highway all the way to the Arctic Ocean. Along the way, the students prepared for their final project, a public debate at the Yukon Beringia Interpretive Center back in Whitehorse on the topic of whether climate change is locally a net benefit for people living in the Yukon. "This was an opportunity for the students to synthesize everything they've learned in different classes as undergraduates, and bring it all together to develop compelling arguments with real-world implications," Shapiro said. "This experience will have a long-lasting impact on the students, to have seen this part of the world that is changing so rapidly from climate change." The students talked to local people all along the way, including people living in a First Nation community who are facing the challenge of moving their settlement because of sea level rise. "The only positive anyone mentioned was longer growing seasons for agriculture," said Garrison, who graduated this summer with a B.S. in ecology and evolutionary biology. "Sea level rise and melting permafrost is threatening their infrastructure, long-term prospects aren't good for the salmon and caribou that native people depend on, the seasonality is changing, and it's drier, with precipitation more concentrated in heavy downpours. Everywhere we saw how climate change is affecting people." 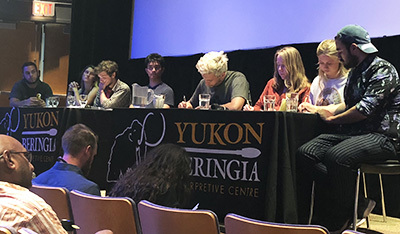 Students had been assigned to take one side or the other in the debate on the pros and cons of climate change, which was held before an audience of 65 people in Whitehorse. Although the pro side came out on top, emphasizing the advantages of a longer growing season and milder climate, they acknowledged that there were stronger arguments on the con side. "We did win, not on substance but on style. They had science on their side, and we had debate technicalities," said Cassatt-Johnstone, who graduated in August with a B.S. in biology and cognitive science. Shelby Dunn, another student on the pro side, said, "We knew we had the harder argument and we were ready to fight. I think the other side was caught by surprise." 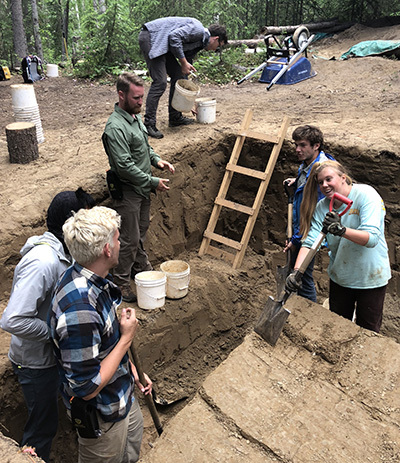 Dunn, a senior majoring in ecology and evolutionary biology, said a highlight of the trip was the gold mining site near Dawson City where Shapiro's research team has been collecting and studying the remains of ancient horses, woolly mammoths, and other Pleistocene megafauna preserved in the permafrost. 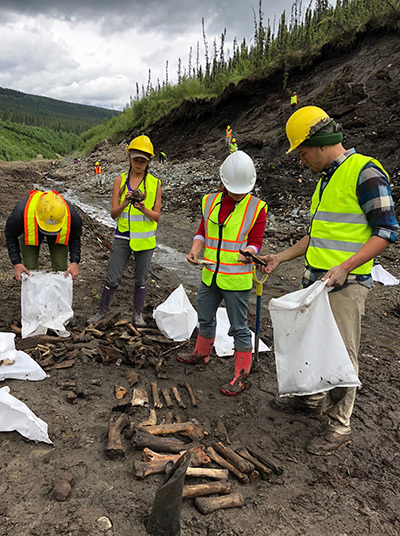 "You could see in the hillside all the different geological ages in cross section, and just the idea that we were seeing bones from the Pleistocene was pretty awesome," she said. The effects of melting permafrost also made a big impression on Dunn. In Dawson City, she saw buildings and infrastructure breaking apart as the ground becomes uneven. The class witnessed an even more dramatic effect of warming temperatures at a "megaslump," where thawing permafrost has caused a deep, expanding sinkhole to open up in the tundra. Several students mentioned the megaslump as a highlight of the trip, despite the phenomenal cloud of mosquitoes that enveloped them at the site. "That was what we like to call type B fun—not fun in the moment, but fun looking back on it," said Cassatt-Johnstone. There was also plenty of what might be called type A fun, including wildlife sightings (grizzlies, moose, etc. ), stunning landscapes, and a new adventure every day. Garrison, a birder, was thrilled to finally see a great gray owl. "It was a very powerful and unique educational experience. Most people don't ever take a field course, but it's an incredible way to learn," he said. One of the things students discovered on the trip was how rewarding it can be to persevere and endure some discomfort and adversity in the pursuit of a goal. The megaslump hike exemplified this for Anthony Aceves. 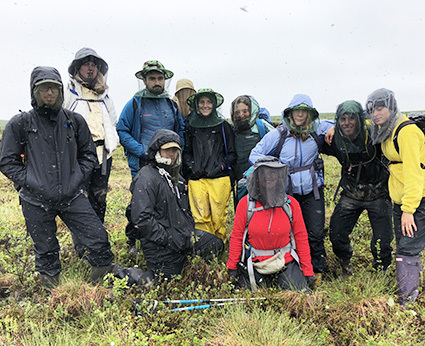 "It was a long, excruciating hike across the tundra, we were eaten alive by mosquitoes, got stuck in the mud, and at the end of the day it was one of the best things I ever got to do. We saw so many cool things," he said. "The lowest point of the trip was leaving on the last day. I just didn't want to leave." Aceves, who graduated this summer with a B.S. in ecology and evolutionary biology and is now pursuing a master's degree in education, said he is drawing from his experiences over the summer in his student teaching at a middle school in San Jose. "I'm teaching them about climate change and fossils, and being able to talk about my own experiences makes it more meaningful for the students," he said. "I never thought I'd be able to do something like that, and it inspires the kids to think it could be a possibility for them."